The WORCESTER PARK Blog :: Permit Parking? One curiousity to emerge in the recent consultation on improvements to Green Lane and surrounding areas concerns suggestions from a number of residents that Worcester Park Athletics Club be given help to access their land for the purpose of car parking. Sutton Council officials were, I understand, left scratching their heads after seeing this very specific suggestion cropping up so many times (with almost identical wording) on consultation returns. It turns out it is the result of some well-timed 'lobbying' from Worcester Park Athletics Club who want to access a stretch of land off Green Lane for use as a car park on match days. 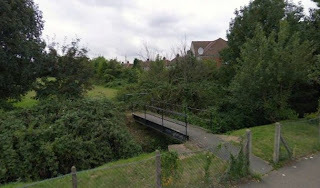 The land in question is understood to be the green space between the retirement home and the rear of Pembury Avenue - currently accessible only by a pedestrian footbridge over Beverly Brook. "I was very annoyed to receive a letter from the Worcester Park Athletic Club proposing that the green field behind my house be turned into a 50 space car park for use by their members & away teams that visit, who only meet up for a few hours on a few days each week. They don't give a hoot that we would be losing another green space, in which local residents walk their dogs & is home to all sorts of wildlife, but it would be used by the unruly kids to get up to all sorts of trouble & vandalism, but would be a disturbance to the residents who live in the home for retired people, who want a bit of peace and quiet! These people should park their cars elsewhere and WALK...or am I missing the point that it is supposed to be an athletic club." In fairness to the Athletics Club, anyone who has used Green Lane on a days when events are taking place there will know full well the impact on traffic and parking on what is already a congested road. Lack of parking facilities for members and visitors was even cited as one of the reasons behind the closure last year of the Worcester Park Bowling Club. So as much as I would regret seeing any green space given over to car parking, perhaps it is a smaller price to pay for keeping a facility such as the Worcester Park Athletics Club as a viable proposition and a valuable local amenity? As far as the Green Lane improvements are concerned, a Sutton Council source confirmed to me that helping the Club access land for parking would very definitely fall outside the remit of the improvement fund for Green Lane.